Upper Deck's Trilogy has always been an interesting brand for me as it has always sat in a unique part of the hockey card spectrum. 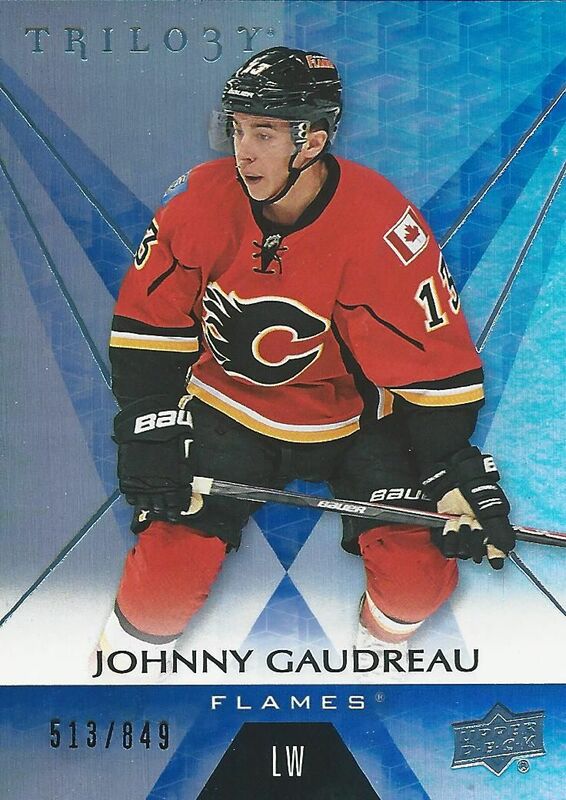 When it came out, it was one of the higher-end brands... but not quite at the level of Upper Deck's big guns in Ultimate Collection, Premier, and The Cup. It was a notch below, but still above brands like Artifacts. 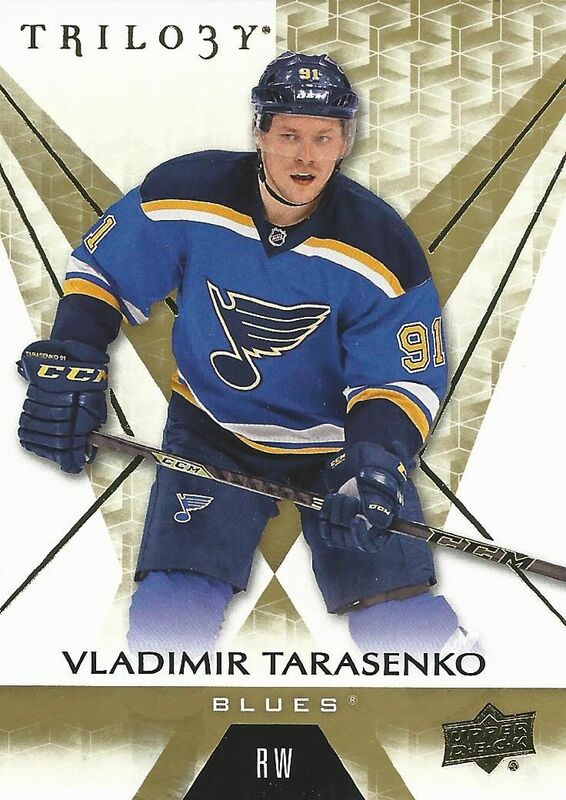 Now it looks as if Upper Deck has brought it closer to the mid-range territory with a price to match. The Trilogy base cards are on a nice glossy stock. Gold foil is used as accents nicely around the card to help it stand out. 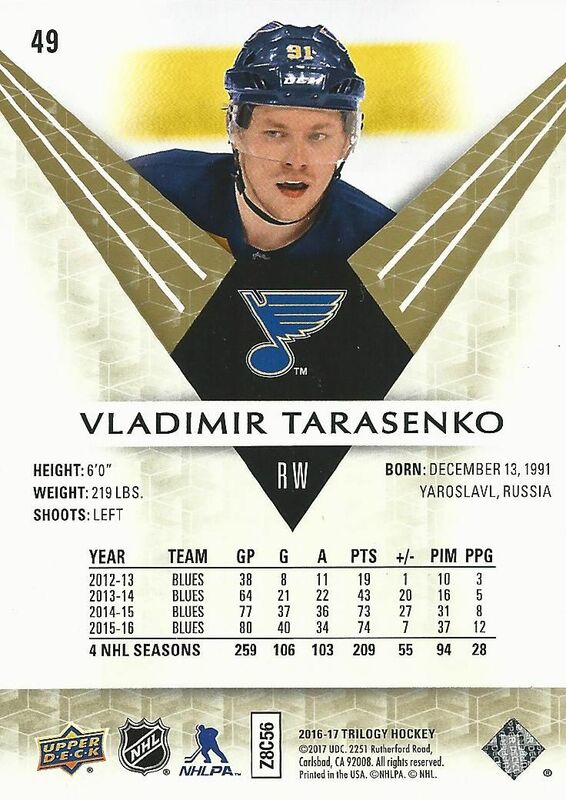 Each base card has a predominantly white and gold color scheme with a large photo of the player in front. Looking closely at the card, you'll notice many lines and patterns in the background. 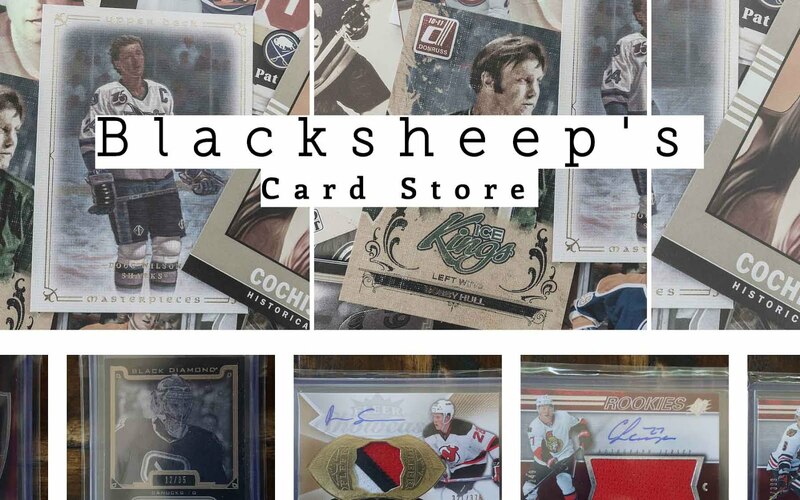 It's a dynamic look for a card, and collectors for collector that enjoy a busier look, these might just be up your alley. Though the cards don't really have a flaw to them, I do not find the design to be particularly memorable. They're nice for what they are, but I'm not sure I'll remember them specifically in a few years. Trilogy isn't a set that collectors clamor over the base, they're just there to fill the packs around the hits mostly so for that job they're doing a great job. The back of the Trilogy base cards share similar design elements as that of the front, but it comes off looking rather generic. 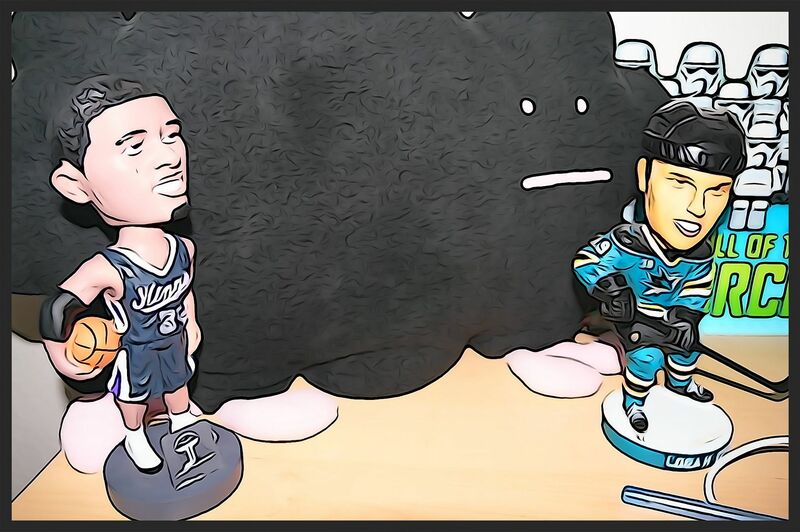 Upper Deck's other releases this year have generally been better crafted than these. These cards just have the relevant stat information on a cookie-cutter like design. There is not paragraph to read about the player so there isn't much interest generated here. The rookie cards in Trilogy are called Rookie Premieres. The set comes in three tiers, but I'd consider the most basic card the main rookie with the other tiers are more inline with an insert or parallel card. 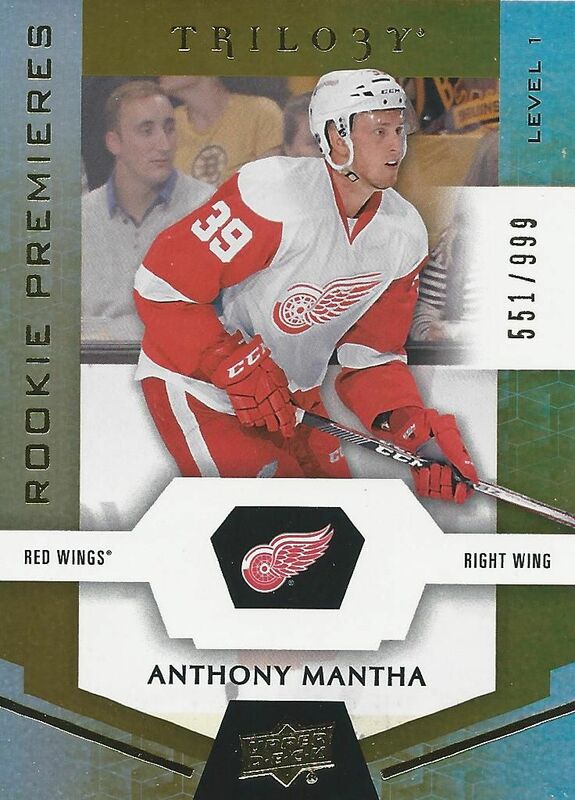 Rookie Premieres are completely foiled cards numbered to 999. The design has a few elements in it that are a call back to the standard base, but it'd be hard to tell with a quick glance. Overall these rookie cards are well done. I think collectors will enjoy the shimmer and shine of these cards, especially compared to the other cards in the main set. Each box of Trilogy comes with 8 packs and run a little over $100. To me, it's very similar to what you would get in Artifacts, but with hits configured in different designs. Collectors should expect to find around three hits in the box. The rest of the packs should have at least an insert/serial numbered card beside the base cards. I got quite a few of these blue rainbow foil parallel cards in my box. These cards parallel the base set and are numbered to 849. The foil is a good look for these cards, and it improves upon the standard base card by a good amount. Black and green parallel variations are also available as are printing plates of the base set. 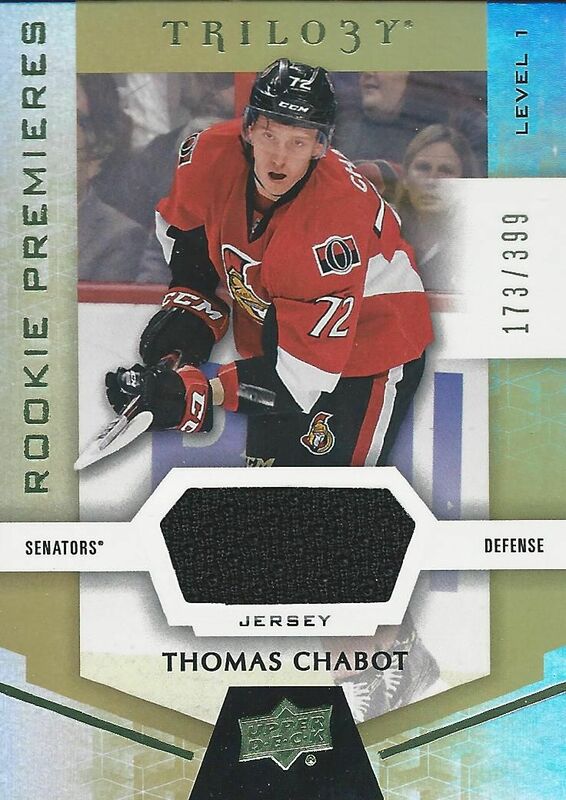 Numbered to 399 was a jersey parallel of a Rookie Premieres rookie card of Thomas Chabot. It's a simple card with an embedded event-used piece of jersey. These aren't too exciting to get, even if you pull a top rookie. The higher level patch variation of the Rookie Premieres are much nicer than the jersey variation that I showed above. It helps that the patch I pulled was very nice with many colors and breaks. This patch card comes on very thick stock and is numbered to just 35. 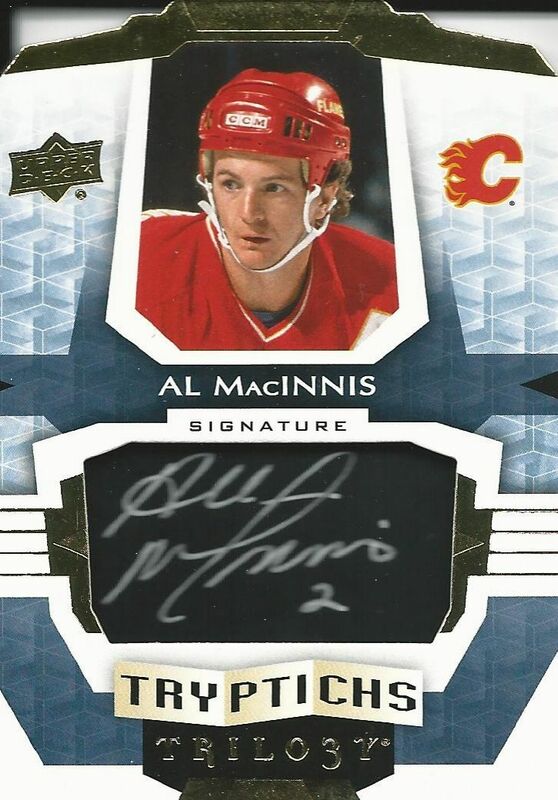 My favorite looking card of the break was a Tryptichs autograph of Al MacInnis. These cards come on very thick stock. The autograph is done on black and embedded in the card. It almost looks like a little chalkboard in there. It's serial numbered to 60, but different cards from the set will have different numbering. Though I didn't get one, Signature Puck cards are back. Trilogy also features much more autograph content and memorabilia content. Like they've done in past years, collectors can also find rookie cards that have inscriptions written on them. I'm glad Trilogy is a bit less expensive than it used to be. There was a time when Trilogy packs were over $20 each. They are more reasonable now with the box price being just over $100. Trilogy can be a fun product, but I'm not sure how bit a hit this set with be with collectors out there. Trilogy has never been one of the more popular brands, and it rarely makes a big splash. If yo're looking for something to tide you over during the season, this might be ok. But honestly, if you miss out on this product, you probably won't be missing too much. Awesome review Luke! This stuff looks really nice this year! I really like how the base cards/inserts look, I may have to buy myself a box! Trilogy has been one of my favorite products. Although.. sometimes its a hit or miss for the price. Trying to pick my own box up soon. Nice Vesey hit too! Great review as always! Good looking product, very nice patch card!! Unlike past trilogy's this year was lacking for me. It's trying too hard to be artifacts in my opinion. But the hits look really nice. Hey blacksheep, nice review and yt vid. I think I'm kinda disappointed with trilogy because of the card design. I think its a little to same with other years. great review as always! This product could have been better the hits are cool though. Nice vid! Seems like a decent product, you had some good hits in there. Loved the MacInnis auto. Love these review black sheep. Nice video, all very good hits, but I prefer the MacInnis auto because it's an Old School guy. Nice review and I completely agree with you. Meh product I'd rather spend my $100+ on SP game used. Nice to see Chabot though! He was superb in world juniors tourney. Thanks! I preferred how Upper Deck used to make Trilogy, but the I find the newer Trilogy alright as well. Nice product! I like the look of all the cards and I love that Macinnis auto! I love the base design! Nice Chabot he did awesome in the world juniors! personalty as a Canadian I find the product to be over priced! we get hit hard now that our dollar is only worth 70 cents american! overall love the review and your channel! I really enjoyed this break. The cards look really nice and shiny. I love trilogy so much. Inserts and hits are always amazing. Great video and great break. Really nice looking cards! Good box hopefully most of them are like that one. Thanks for the contest! Pretty nice haul, MacInnis especially looked fantastic! Another excellent product by UD. They do a good job in keeping their monopoly hobby-fiendly for a variety of spending levels. Great review! Great review. Not sure it's worth the $100. Nice Vesey though. + The foil parallells of the base cards look nice. + The Trypthics autograph cards. - To have different parallells of the rookie cards, even though there already is three levels of them, is very confusing. 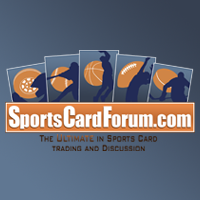 - I don't like the big "frame" on the level 1 rookie cards. Overall, pretty good box break, Luke! Congrats on the Vesey /35 patch and the awesome MacInnis autograph! As always the review is great :) Hope next review will be soon. 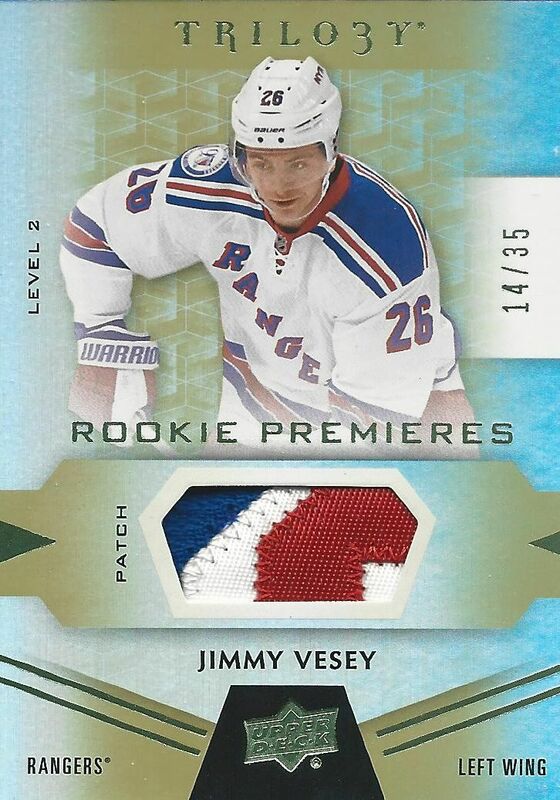 nice review as always love the vesey patch and the basecards are nice. Ahoy there. Thanks again for the UD Trilogy review. The base does not appear classy but the inserts are a bit better. I would stick with Artifacts if they are priced nearly the same. Cheers. I'm a fan of the Insert collection, but there's not as many hits as I thought there would be. Great review on a nice product at a somewhat reasonable price point. I thought the "old school" S/N on the MacInnis left something to be desired IMO. Personally would prefer a standard S/N like you see on most cards today. Nice review and nice hits. Keep up the good work! Nice box, Vesey is nice! Looks like a good product to crack open! Great review! Preferred the design of years past, but no complaints about the lowered price! Good comparison to artifacts. This is probably better imo. Trilogy had better years. Great review as always, keep it up!